Often when I’m cooking veggies the extent of mother’s natures beauty really astounds me. The beautiful colours that start to change once a little heat is applied they become almost iridescent. 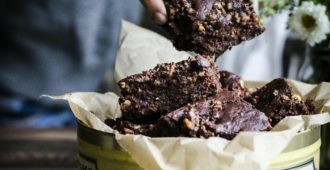 I’ll often have a little moment, just on my own in the kitchen watching the change in the glorious colours….let’s keep between you and me, shall we? 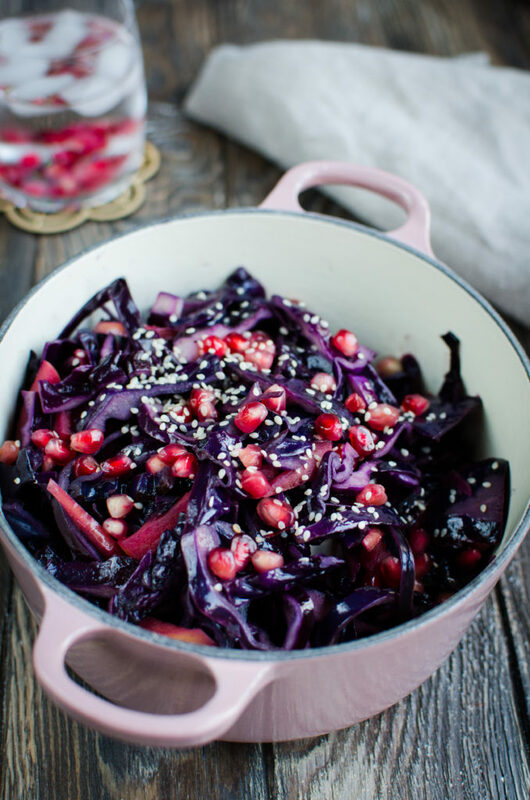 I think this is probably the real reason why I love to cook red cabbage so often…. and because it really pairs well with pork, I mean really well! 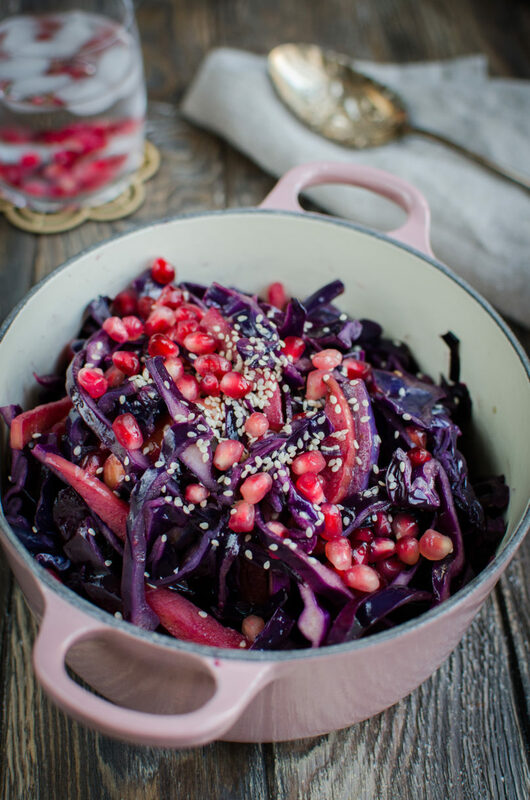 Red cabbage is my favourite, it not only tastes better than green cabbage, but also has way more Vitamin C and antioxidants due it’s beautiful colour. Cabbage in general is a great anti-parasitic due its high sulfur content, great for liver function, ulcers and externally promotes beautiful skin due to the high Vit C and Vit K content. Not only does it keep skin looking younger and beautiful but more importantly helps teenagers with healing acne. I have always been really scared to cook cabbage, I’m sure it stems from my boarding school days where were dished soggy, limp, pale green “stuff” on our plate and forced to sit and eat, and no amount of salt could it taste any better. Having experimented and played around, I have now discovered a whole new world of deliciousness by adding apple, pomegranates and spices, it really does not have to be how Granny used to make it. As I mentioned, this is really yummy with pork… apple and pork, say no more! In a large hot pan, melt the butter/coconut oil, cinnamon, nutmeg and caralamise the apple. Add the cabbage and turn the heat down to a med temperature. Keep turning the cabbage ensuring that it is well coated and cooking through. Squeeze over the orange juice, mix well. Leave to cook until the cabbage is soft yet still tasty - about 10 min, but taste and stop cooking when it is to your liking. 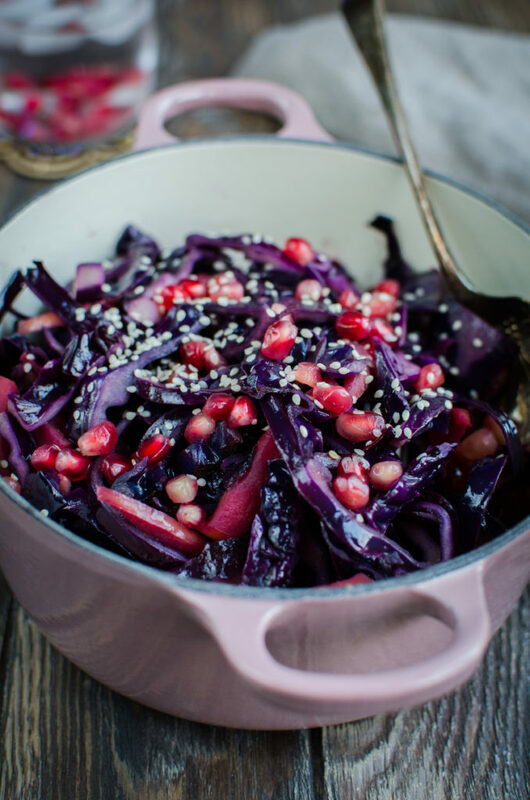 Sprinkle over the pomegranate rubies and sesame seeds just before serving.